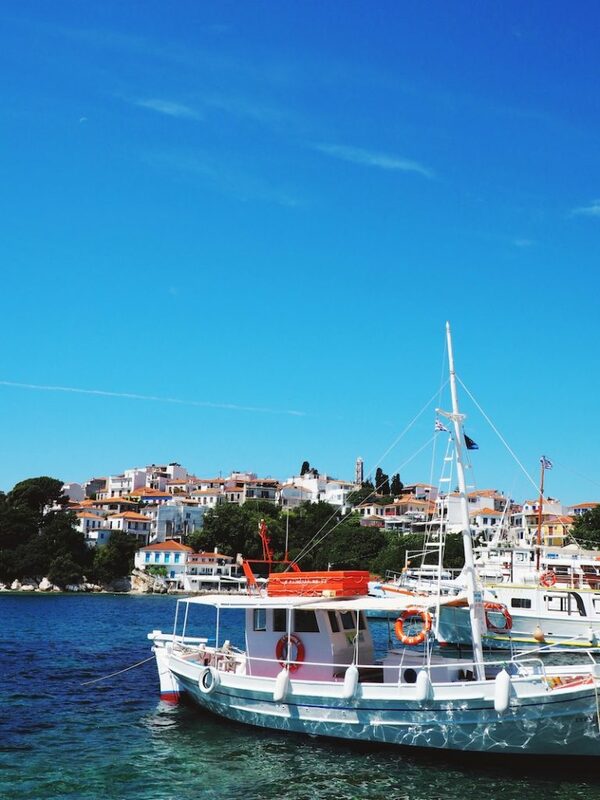 Skiathos is the Greek Island you need to know if you’re after a chic yet understated holiday. This small island in the Sporades has a lust-worthy mix of beachfront bars, a white-walled old town and picture-perfect pools with a much more affordable price tag than some of the more Instagrammed Greek Islands. 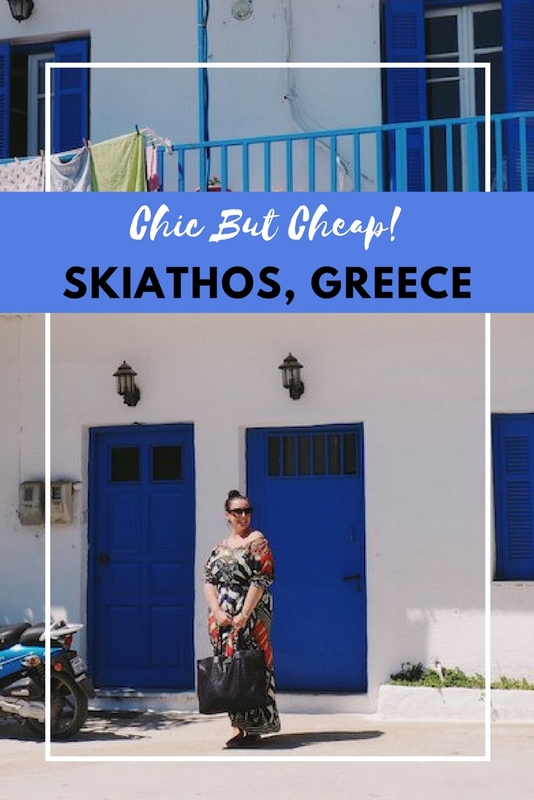 So if you’d like a stylish holiday for less money than it looks, check out this chic (but fairly cheap!) 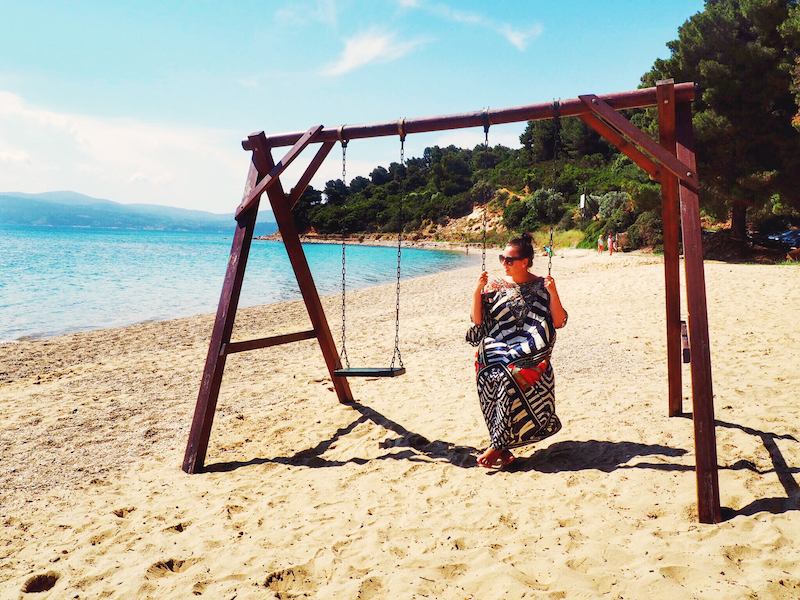 guide to Skiathos, Greece. 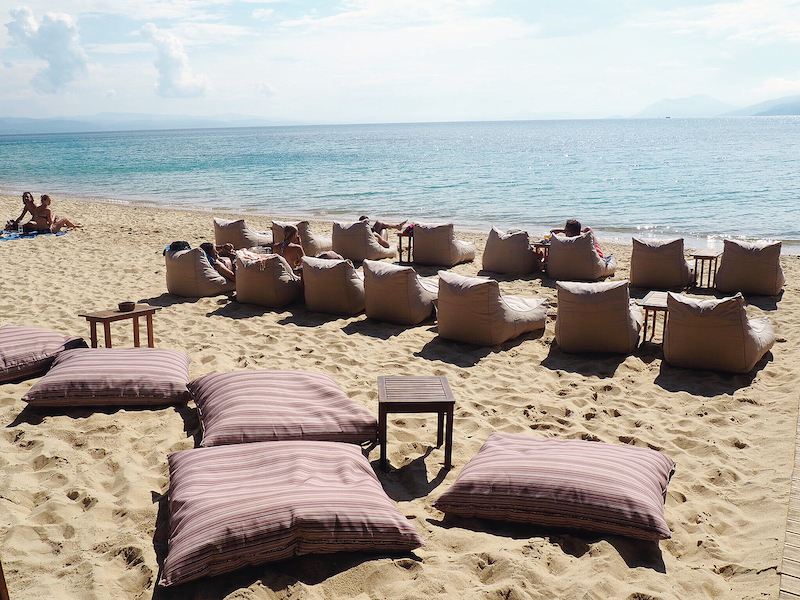 If you’re anything like me you’ve come to Skiathos to do very little except lie back and soak up the sun’s rays at some of the island’s golden beaches. Between my last visit to Skiathos and my recent romp with Vicky Flip Flop I’ve susseed out almost every beach in Skiathos. On both visits my hands down favourite was Agia Eleni. You’ll need to hop on the local bus or hire a jeep to reach Eleni as she is on the west coast of the island. 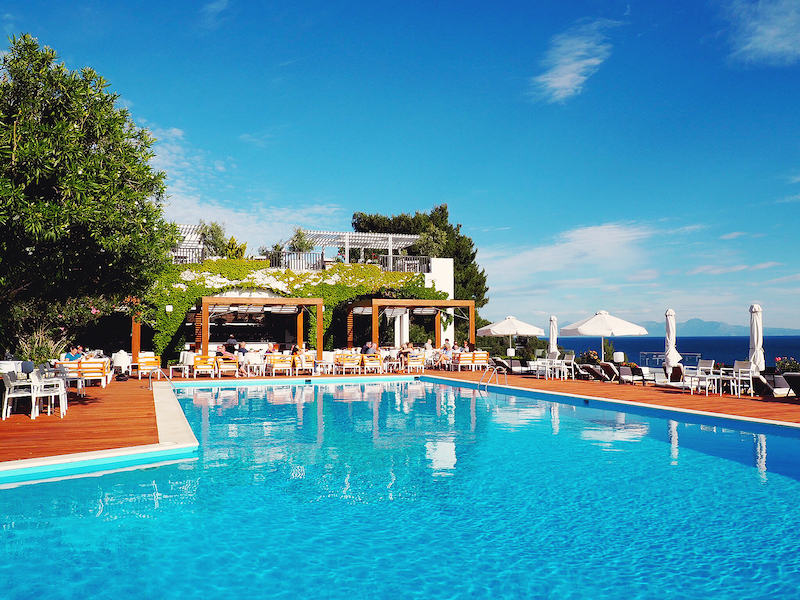 (Just a 10-minute drive from the Skiathos Princess Hotel – more of which later). 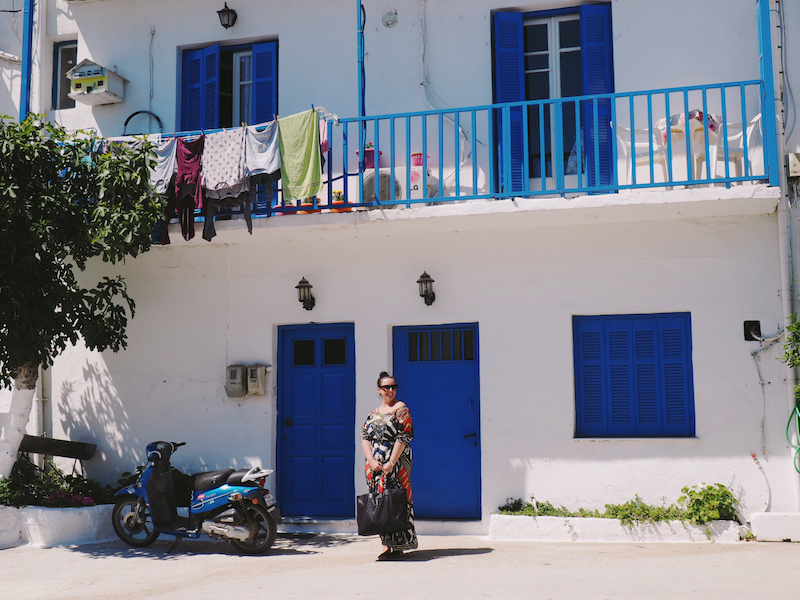 Agia Eleni – where Skiathos meets Bali! The reason Agia Eleni appeals to me is that its shallow waters and golden sands come with a taverna for all your food needs and a bar for all your cold drink/beach beats requirements. It’s also one of the best spots to watch sunset, especially if you’re lying in one of the bar’s bean bags sipping an ice cold Mythos for 3 Euros. Other stand out beaches include Koukanaries, which is a long golden sweep where you can try various watersports. 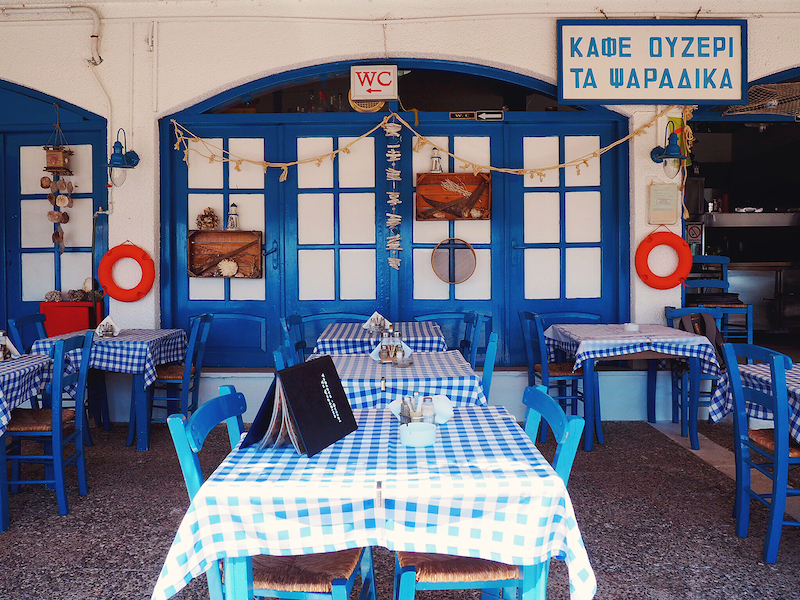 Try Vromolimnos if you want to hang out with the cool crowd and Kanapitsa Taverna if you want to have a laid-back lunch directly on the waterfront. If you’re looking for a party then Banana Beach is the place to go but as we visited in the off-season (plus felt we might be above the average age of visitors) we didn’t check this out personally. If you don’t fancy driving the winding roads a good way to see the island is by hopping on a boat. Boat trips, departing from Skiathos Town, tend to take you to a couple of the beaches I’ve mentioned above plus head to Lalaria, a gorgeous pure white stone beach that can only be reached by sea. To explore the lush interior and some of the old monasteries on the island hire a car and head inland. 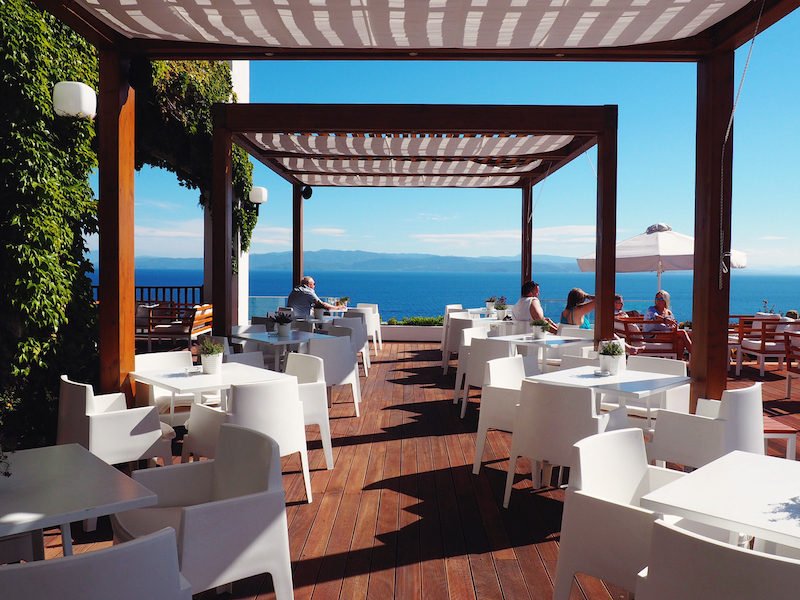 Olive Thea Restaurant is a great place to enjoy home-cooked food with incredible views – and they even offer free transfers from your hotel if you’d like someone else to do the driving. 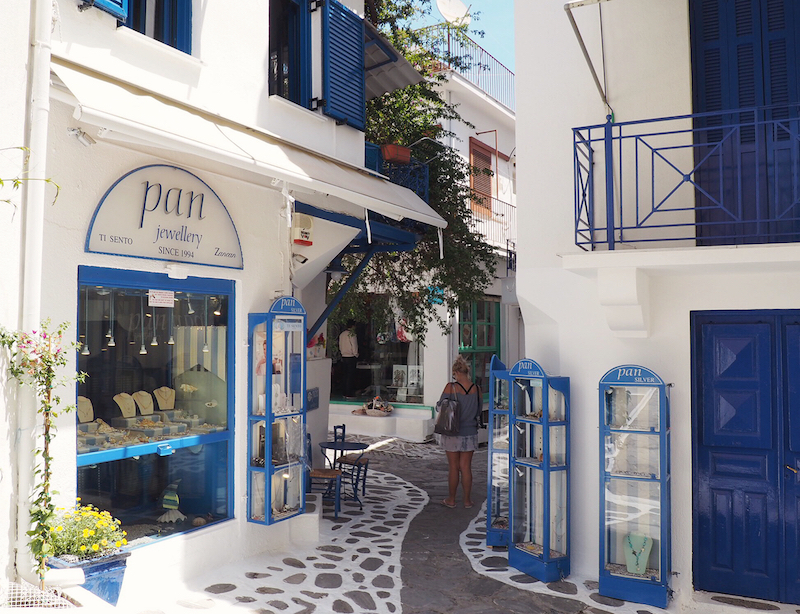 It’s well worth spending some time wandering around Skiathos Old Town, admiring the architecture and sniffing out trendy boutiques in the narrow backstreets. 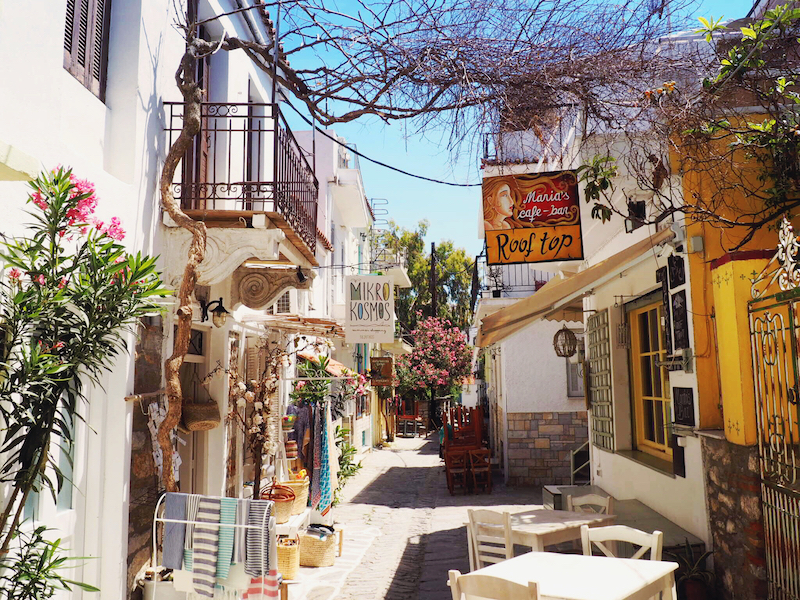 I completely missed the most charming tavernas and shops in Skiathos on my first visit because I didn’t get off the main drag, so I can’t stress strongly enough how important it is to get lost in the laneways. If you’re a fan of espadrilles, straw baskets with pom poms and beaded kaftans (and who isn’t?) you’re going to enjoy shopping here. Another must-do in Skiathos Town is a night at the open-air cinema, which shows new releases as well the movie that put Skiathos on the map. The Mamma Mia! Movie Night, held 3 times a week, is not just a cinema experience but is a raucous night out where audience participation is positively encouraged, although obviously not during the talking bits! I hadn’t seen the Mamma Mia movie for years and now nothing can top watching it under the starts in Skiathos, whooping every time the island came on screen and jumping out of our seats to sing and dance along to every ABBA track. There are a few surprises from your hosts too but I won’t ruin that for you – just go along and have a right giggle! 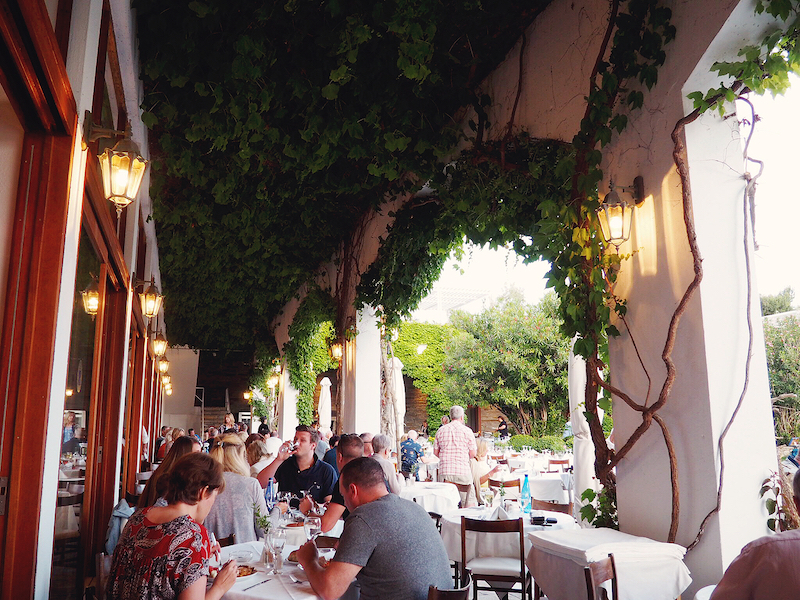 Could this taverna be any more Greek?! 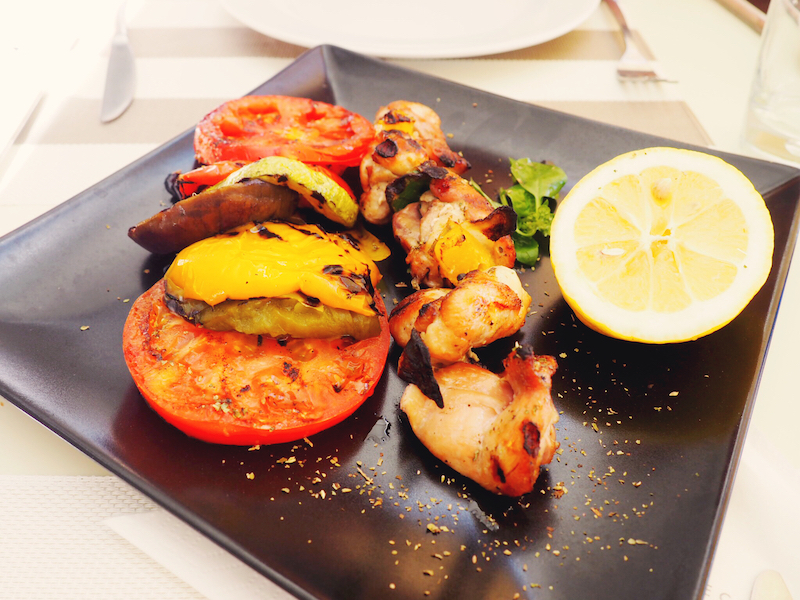 On both trips to Skiathos some of my favourite meals of the trip were at the Skiathos Princess Hotel. Their PR Ammos Restaurant, located mere steps from the water, produces sophisticated Greek Cuisine – even the Greek Salad was a work of art! When I visited with my husband we enjoyed a light lunch and a steak dinner at PR Ammos, which looks even more magical with twinkly lights by night. On this visit, Vicky and I were positively spoiled with a tasting menu that included zucchini fritters, feta in filo, souvlaki and the most divine chocolate desserts complete with edible gold spoons. (Yes really!) We headed to the hotel’s Harmony Club Spa shortly after this feast and I was pretty much in a happy bubble for the rest of the afternoon. 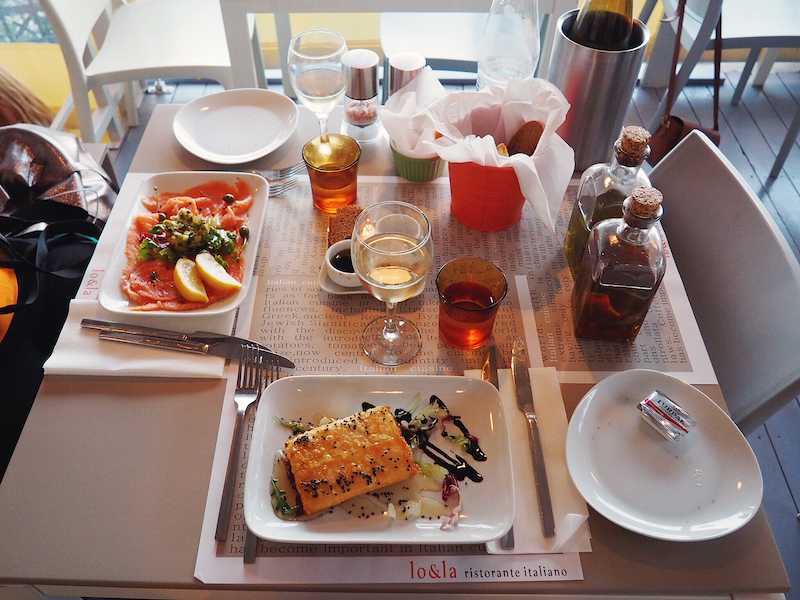 We had some wonderful meals in town too including Italian at Lo&La, which is hidden a little way up the cliffface overlooking the old port. 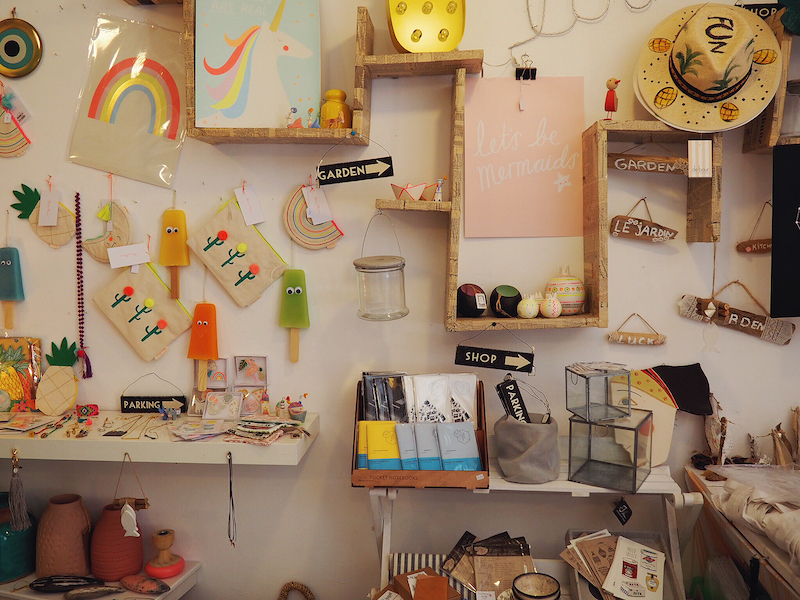 The owners are a delightful couple who plied us with delicious food and then hugged us as we left – I can totally see why the locals love this place. On the other side of town you’ll find a number of seafood restaurants on the approach to ‘Club Strip’. This part of town was not yet open for the season during our visit but we heard that Limanaki, the first restaurant on the strip, comes highly recommended. Justin and I also enjoyed a meal at the Windmill Restaurant on our visit to Skiathos. With views overlooking the moonlit harbour and seats dotted in semi-private arrangements around the terrace, come here if you’re looking for the romance factor. 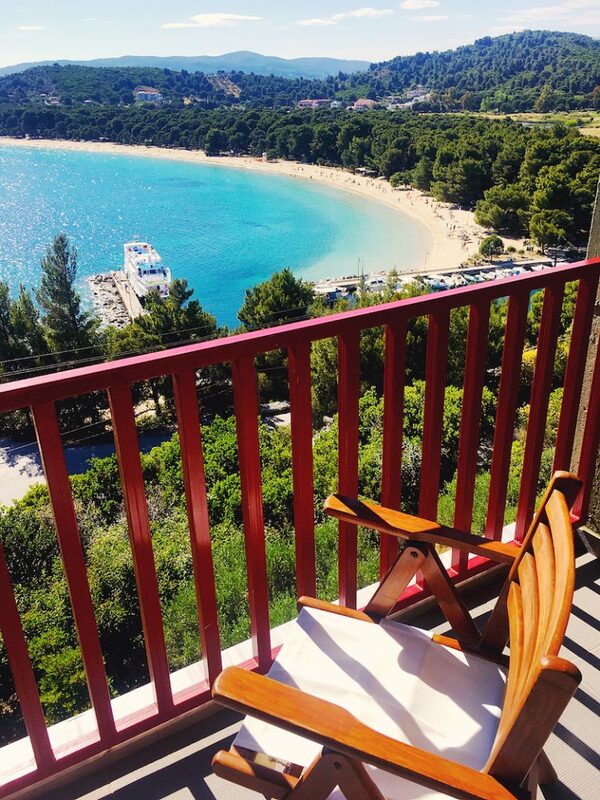 We stayed at the Skiathos Palace Hotel which has recently undergone renovations that make the most of its lofty perch above Koukanaries. The pool area especially makes the most of the incredible vistas (all the way to the mainland) and you feel glam just by virtue of reclining by it. Vicky and I stayed in generous-sized beach front rooms, which also had incredible views, although I personally might have gone with more of a neutral colour scheme for the bedding! We stayed on a half board basis and rather fortuitously were around for BBQ night, which turned out to be an epic feast involving a pig on a spit and more dips than I knew existed. Breakfast was also a generous affair with all the British favourites (sausage, egg, beans) plus a variety of Greek options including fresh yoghurt and honey, multiple hams, cheese pies and pastries. Check out Olympic Holidays for great deals on holidays in Skiathos including flights, transfers, accommodation and orientation from your bubbly resort rep. I travelled to Greece as a guest of Olympic Holidays. All opinions are my own.